Border Patrol agents used tear gas to repel about 500 migrants who stormed a border crossing near San Diego this week as President Trump moved to restrict their ability to claim asylum in the U.S. The chaos ensued after 7,400 members of a caravan that departed Central America on Oct. 19 began massing in Tijuana, near the San Ysidro Port of Entry to the U.S. With only about 60 asylum claims being processed daily and food scarce in their tent city on the Mexican side, a group of frustrated migrants marched on the border barriers to demand entry. When they were blocked by Mexican federal police, scuffling broke out, and some migrants scaled the wall while others pried holes in fences and sprinted through traffic. Some hurled rocks and bottles at border agents, four of whom were struck, although none was seriously injured. Border agents fired volleys of tear gas over the border to drive the migrants back, with women and children caught in the choking fumes. “We ran, but when you run the gas asphyxiates you more,” said Ana Zuniga, a 23-year-old from Honduras, who was carrying her 3-year-old daughter. “The officers were right to repel the crowds,” said The Wall Street Journal. Our country “can’t tolerate migrants who rush the border or assault officers with rocks.” The tragedy is that the migrants’ “lawlessness” will erode “support for legal asylum in the U.S.” Germany should serve as “a cautionary tale.” Chancellor Angela Merkel welcomed a million Middle Eastern migrants to her country in 2015—but social problems caused by the massive influx sparked “a political backlash that has abetted the far right” and turned many Europeans against accepting any additional refugees. Yes, we must defend our borders, said the New York Daily News, but we must also defend “America’s principles.” Under U.S. and international law, people who make a credible claim that they face persecution and violence at home can apply for asylum. If Trump weren’t promoting “fever dreams of an ongoing invasion” to stir up his base, he wouldn’t send troops to the border—he’d send hundreds of asylum officers and immigration judges to expedite claims. Actually, Trump was at least half-right about the caravan—while the media was wrong, said Rich Lowry in NationalReview.com. Trump’s critics scoffed at his description of the migrants as “an invasion”—but we’ve just seen hundreds try to scale fences. The “overwhelming majority” of these migrants are not criminals and “just want a better life.” But we have a right to demand “an orderly, lawful process,” and to limit how many people we accept. 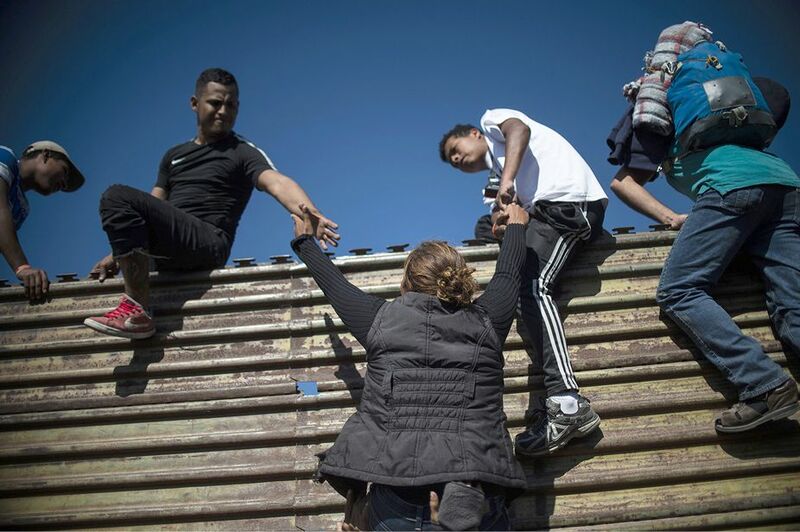 The reality is that most of these migrants do not qualify for asylum under U.S. law, said John Daniel Davidson in TheFederalist.com. Of the nearly 64,000 applications heard in court in 2016, less than 14 percent were approved. Most Central American migrants are not fleeing political oppression; “for them, claiming asylum is simply a way to gain entry to the U.S.” where they can “live and work” while their cases go on for years.